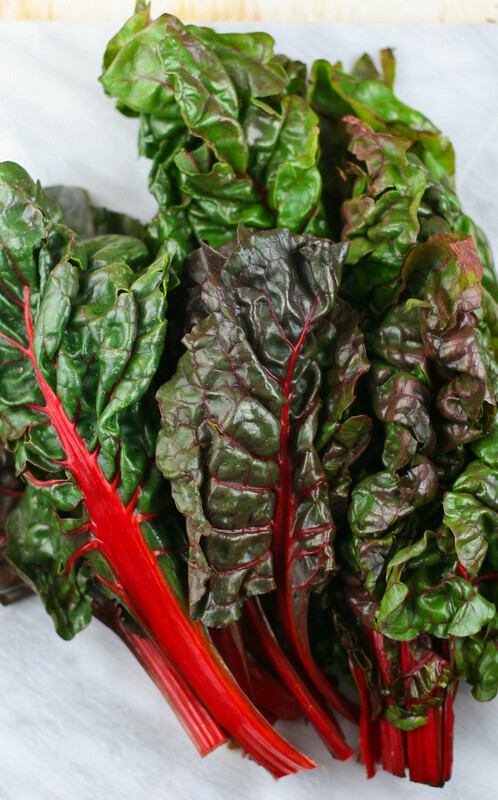 This tasty green is often overshadowed by the ever-popular kale, but chard deserves some time in the spotlight! The stems are celery-like, and the leaves are nice and crinkly like spinach :). 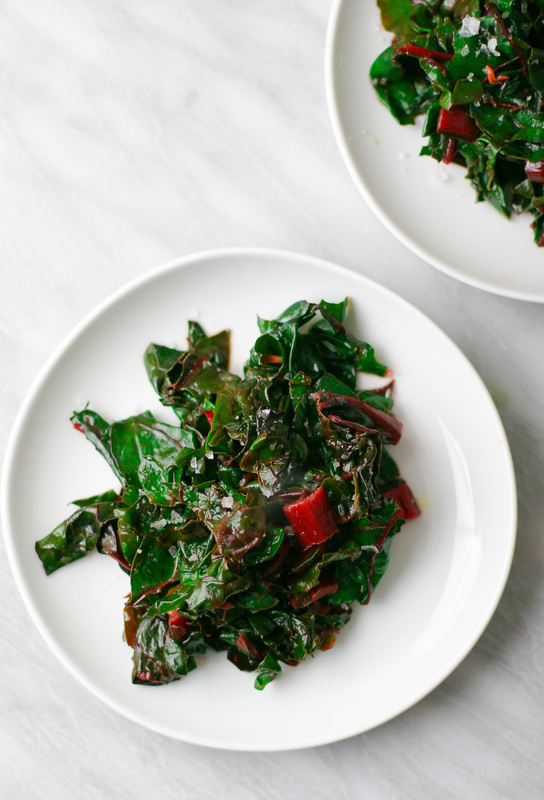 Chard typically has white, yellow, or red stems, and can be bought separately or in a rainbow-blend of all 3 colors. Chard is actually in the same family as spinach, beets, and quinoa, so it has some powerhouse nutritional benefits. 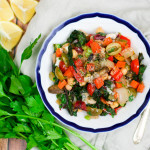 Chock full of fiber and phytonutrients, it’s a GREAT source of vitamins K, A, and C.
It’s delicious, nutritious, and super versatile for cooking. I love chard raw, shredded or torn into salads or slaws, quickly sautéed with some garlic and olive oil, or tossed into soup or stews for the perfect finishing touch. But there’s one preparation I come back to again and again. Simply sautéed in olive oil and lots of garlic, sprinkled with flaky sea salt, and finished with a fresh squeeze of lemon. YUM. The nice thing is, you can do this with pretty much any green. Spinach, kale, collards, beet greens, etc. It’s a great easy prep-method you’ll come back to again and again. 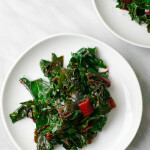 Wash your Swiss chard throughly (the curly leaves love to capture grit!) and pat dry. Cut the very bottom of the stems off and discard. Slice the rest of the thick stems into 1/2 inch slices. Roughly chop the rest of the leaves (I do this by slicing each leaf into 4 long slices, then roughly chopping crosswise into ~2-inch squares). Add the olive oil and sliced garlic to a large skillet and cook over low heat, stirring often, until the garlic is tender and just golden, but not browned, about 5 minutes. 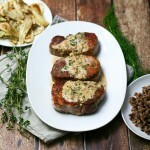 If the garlic is cooking too quickly, turn down the heat. 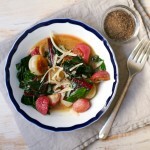 When the garlic is tender, add the chard (leaves and stems) and increase the heat to medium. Cook, stirring occasionally, until the chard is just wilted and the stems are crisp tender. Turn off the heat, squeeze the lemon over the top of the chard, and sprinkle generously with flaky sea salt. Toss quickly to coat, then serve!